2/19 - 3/17: The Ash was a sacred chieftain tree, believed to "court the flash" since it was prone to be struck by lightning. The wood of the Ash was thought to be enchanted and was used by the Druids to fashion wands and spears. Its twigs were placed in circles as a protection from snakes, while witches would use the timber as handles for their broomsticks. Children would be passed through the branches of an Ash in order that they might be protected and to cure them from illness. Ash leaves were placed under pillows to induce prophetic dreams or placed in bowls of water to ward off ailments. The Celts believed that the Ash originated in the Great Deep or the Undersea Land of Tethys. It belongs to the trilogy of sacred Irish trees (the other two being the Oak and the Hawthorn) and is said to offer particular protection from death by drowning. The seeds of the Ash have long been used in love divination. If the seeds did not appear on a certain tree, then its owner was thought to have been unlucky in love or a future venture would be unsuccessful. In Northern England, it was once believed that if a woman placed an Ash leaf in her left shoe, then she would be fortunate enough to immediately meet her future spouse. In Greece, the Ash was sacred to the Sea God Poseidon and in Ancient Wales and Ireland, oars were made of this wood. The shade of this tree is said to be harmful to plants because its roots will strangle other roots. The Ash of the Ogham alphabet is the Cosmic Ash, also known as the World Tree. 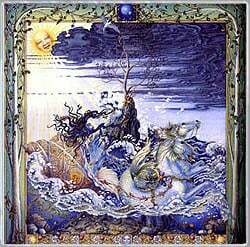 It appeared in Norse mythology as Yggdrasil, the Tree of Odin (or Woden) who hung upside-down from its branches in order to gain enlightenment into the secrets of the Runes. Gwydion, the Celtic equivalent of this Norse God, was known to choose the thick, strong twigs of the Ash for his wands and was renowned for his magical abilities. The Ash has roots which deeply penetrate the soil, souring the ground and making it difficult for other vegetation to grow beneath it. The wood of the Ash is tough and pliable and often used in weaver's beams. This tree was indicative of the linking between the inner and outer worlds. In Norse legend, it was an Ash which spanned the Universe...with its roots in Hel and its boughs supporting the Heavens and Earth at its center. In Celtic lore, the Ash connected the three circles of existence...Abred, Gwynedd and Ceugant...which may be interpreted as the Past, the Present and the Future, or as Confusion, Balance and Creative Force. There was no hell in Celtic beliefs...only continual rebirth as passage was made from circle to circle until the Land of the Blessed was finally reached. The Common Ash is a large, deciduous shade tree with grey-brown bark furrowed in diamond patterns. A major tree of the lowland forests in much of Europe (together with the Oak and the Beech), it can grow to 130 feet in height on open sites, with a broad crown reminiscent of the American Elm. The Ash was and still is an important timber tree and traditional material for the handle of a witch's besom. The Common Ash is occasionally cultivated in North America and similar native Ash species are widely grown as street trees. The Ash is a member of the Olive family. The Ash is a tenacious tree, such that it is not unusual for a singular branch to begin to sprout from one tiny point on the bark of an otherwise dead trunk. There are two distinct types of Ash individuals (a division which relates to all Celtic Tree Signs). The "new moon" character is associated with the first two weeks of a sign and the "full moon" character is associated with the last two weeks. The "new moon" Ash individual tends to be more impulsive and demonstrative when it comes to emotional relationships. Although he or she may appear apprehensive, hiding beneath the surface is an immensely spontaneous person. The "full moon" Ash individual tend to be a natural exhibitionist who responds to situations with great generosity of spirit. This may be considered by some as a certain gullibility or naivete, but this apparent weakness is just that...merely apparent. In truth, it is the outward display of a humble spirit...a rare and much-coveted quality. In general, all Ash individuals tend to have duality in their natures. On one side, they are artistic with an aura of vulnerability...on the other side, they are quite pragmatic. Being compassionate and sensitive, they understand the baser elements of humankind, as well as the spiritual aspect. The compassion of Ash individuals also extends to the animal kingdom and they have an innate ability to relieve suffering, both by physical nursing and the power of prayer. The faith of the Ash is rarely orthodox in a religious sense, but they are highly intuitive individuals, often possessing a strong deeper sense of spiritual matters. Ash people are highly adaptable and, despite a frail appearance, can recover from almost any emotional blow. On the negative side, theose governed by the Ash frequently experience trouble when handling the more mundane practicalities of everyday living. Often easily influenced by others, the Ash individual can be low on self-confidence and may become isolated. Ash people have a creative genuis for making money but frequently fail to carry a project or idea through to its completion. As children, they require careful direction in order to learn how to use their talents to the fullest potential. Possessed of a somewhat mystical quality, Ash individuals are drawn to fantasy worlds. They adore the theater and movies, frequently blessed with beautiful singing voices although their preference is to work behind the scenes. They are also usually attracted to the ocean...or any other body of water...sometimes with fascination and sometimes with fear. There is no compromise for the vulnerable Ash individual where water is concerned...it will be one or the other. The career of the Ash person should never involve a routine which is too strict. The arts are a good choice but, because of the compassionate nature of these individuals, they are often drawn to the medical field and are good at organizing charitable functions. Ash individuals are quick-witted, spontaneous and gregarious. They possess a lively curiosity and are intelligent, persuasive speakers. Being enthusiastic, inquisitive and communicative, Ash people love engaging in discussions about new ideas and projects. They are gentle individuals and, though easily hurt, are able to cope well with the negative in addition to the positive. They make for kind and considerate friends, ideal sweethearts and caring parents. Being romantics and dreamers, Ash individuals frequently appear to have one foot in the "Land of the Sidhe" and strive constantly to keep order in their lives. On the negative side, Ash people possess a nebulous quality which can lead to an inability to cope with the practicalities of everyday living. They are also easily influenced by others and have a hypersensitive nature which can undermine their self-confidence and ambitions. It is important for Ash people to focus their mental abilities or they are inclined to become nervous and irritable.